Headlining “FIGHT NIGHT at the HORSESHOE HAMMOND” is an outstanding eight round cruiserweight clash between undefeated Chicago fan favorite DIMAR “Strongman” ORTUZ and hard-hitting Ghanaian DANIEL ADOTEY ALLOTEY. 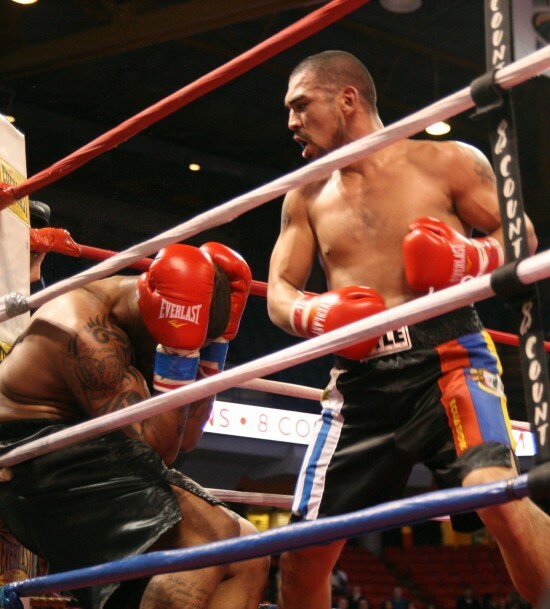 Compiling a record of 9-0-1 with six knockouts, Ortuz will be making a quick return to action following his action packed six round war with Mitch Williams on April 18 at the Horseshoe Casino. The southpaw Allotey, 15-6-0 (8KO’s), will be making his Chicago debut having fought three previous times in the United States. Co-featured at “FIGHT NIGHT at the HORSESHOE HAMMOND” on June 20 is the highly anticipated return to battle of popular lightweight attraction FRANKIE “Time Bomb” SCALISE in a scheduled four round tilt against newcomer JUSTIN GAUTHIER of Green Bay, Wisconsin. Returning to the ring following his two sensational stoppages in 2013, Scalise, 7-1-0 (7KO’s), will look to continue his four-bout knockout streak. If Scalise and Russell Fiore, also appearing at “FIGHT NIGHT at the HORSESHOE HAMMOND”, are both victorious look for a cross-town showdown on August 23rd’s “Boxing at the Ballpark” event at U.S. Cellular Field, reminiscent of the Tony “The Rock” LaRosa vs. Lenny “The Rage” LaPaglia epic Chicago clash promoted by Bobby Hitz in 1994. Headlining the undercard heavyweight prospects NICK ASBERRY of Waukegan, Illinois and “Gentleman” JAMES SHORTER of Elkhart, Indiana will clash in a scheduled four rounder. The 23-year-old Asberry has quickly impressed Chicago area fight fans since turning professional last year with four dominant wins, two by stoppage. Asberry has fought twice in 2014, scoring four round shutout decisions each time, most recently dominating Raymundo Lopez on March 7th in Elk Grove, Illinois. Shorter will be making his first start of 2014, having lost a very close majority decision to undefeated, hometown prospect Paul Barker April 27, 2013 in Toledo, Ohio. Popular Chicago based amateur SAM HOROWITZ will make his highly anticipated pro debut in a scheduled four round light heavyweight clash with Mukwonago, Wisconsin native MIKE REITER. Local welterweight newcomer WILL COIX will make a quick return to action following his second round knockout of Justin Gauthier in his pro debut on April 18 at the Horseshoe Hammond. Coix will face THOMAS AMARO, 2-5-0, of Holland, Michigan in a four round bout. Popular lightweight RUSSELL “Rocky” FIORE, 11-2-1 (7KO’s), will look to continue his hot streak against TIM CARRIZALES, 4-11-1 (3KO’s) of Waukesha, Wisconsin in a scheduled six rounder. Fiore is currently riding a six bout-winning streak dating back to March 2012. Undefeated bantamweight prospect ADAN ORTIZ, 6-0-0 (5KO’s), of Sterling, Illinois, returns to action following a year long absence battling Merrillville, Indiana’s ANTOINE KNIGHT, 3-7-0 (1KO) in a four round bout. Light heavyweights will also see action at “FIGHT NIGHT at the HORSESHOE CASINO” with Carpentersville’s SIMON “The Punisher” BUETTNER, 5-1-0 (3KO’s) scheduled in a four round bout with Chicago’s WILLIAM CHOULOUTE, 1-3-0 (1KO). Buettner will look to return to the win column following a very close four round decision loss to Greg Sykes on January 31. Advance tickets starting at $25.00 for “FIGHT NIGHT at the HORSESHOE HAMMOND” are available at all Ticketmaster outlets, The Venue/Horseshoe Box Office and HitzBoxing.com. Doors open on the night of the event at 7:00 p.m. CT with the first bell at 7:30 p.m. CT. The Horseshoe Casino is located at 777 Casino Dr. in Hammond, IN 46320.